By plane: From Vaclav Havel Airport in Prague, take bus 100 directly to the Zlicin metro station (yellow line) and continue straight to final station Cerny Most. Take a bus from Cerny Most to Liberec. It will take just an hour and half to get there. By train: At the main train station in Prague, transfer to the metro (red line). Change to the yellow line at the Florenc station and continue to Cerny Most. Take a bus from Cerny Most to Liberec. By car: The best way to get from Prague to Liberec is on the R10 expressway, from which you will turn onto the R35. From Liberec, take the Bedrichov Jizerská road about 10 kilometers to the destination. You find all train/bus timetables on www.idos.cz, English and German versions available. We recommend booking tickets for the bus well in advance. 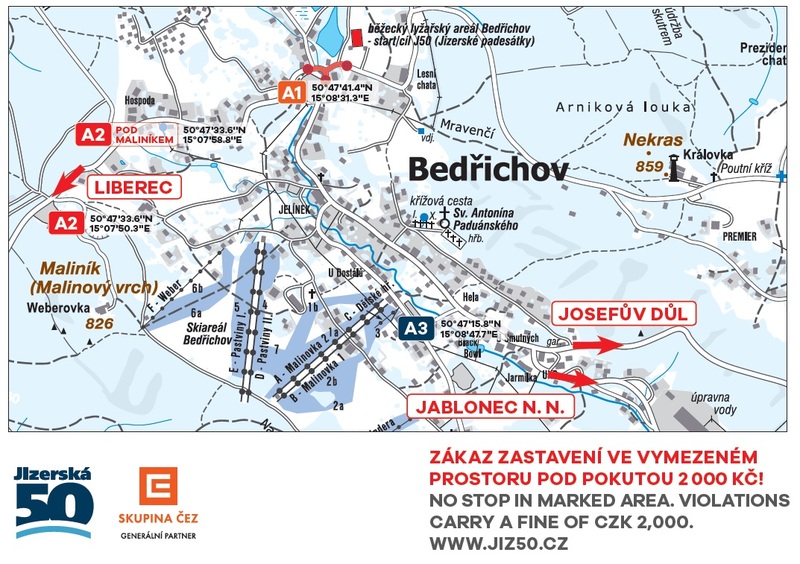 Bedřichov is closed to traffic from 6.00 a.m. to 9.00 a.m.
Advance reservation of a parking space for the entire day – reservation of a parking space possible by on-line registration of a racer for Jizerská 25 race for amount of 300 CZK; parking card is issued during the distribution of the starting numbers. Advance reservation of a parking space for the entire day – reservation of a parking space possible during by on-line registration of a racer for Jizerská 50 race for amount of 300 CZK; parking card is issued during the distribution of the starting numbers. issued only by the municipal office Bedřichov (local residents, owners/lessors of real estate). BLESK TAXI, telefon +420 485 109 090. Web: http://www.blesktaxi.cz/.